The British are coming … Again! While Paul Revere is probably rolling in his grave, Pichon’s American fans will be rolling over with laughter as they read the next book in the hilarious saga of British fifth grader, Tom Gates. 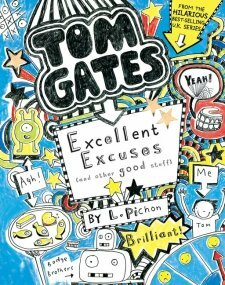 Those who read Pichon’s first book, The Brilliant World of Tom Gates, will find that Tom, now on a two week break, is still up to his usual hijinks: finding new and improved ways of annoying his sister, Delia, devising the most ingenious excuses to get out of troublesome situations, eating his favorite snacks (caramel wafers), doodling, and hanging out with his best mate (friend), Derek. The DOGZOMBIES land their first gig, thanks to Tom’s zany grandfather, at the Leafy Green Old Folks Home (where many of the residents truly don’t mind loud music). Their success at Leafy Green even inspires Tom’s principal to ask the band to play at an all school assembly (Tom puts him off by claiming Delia injured his arm when she punched him). In one of the book’s many subplots, Tom becomes suspicious about the growing number of gold stars Marcus has earned on the classroom Gold Star Award Chart. So he begins to spy on Marcus and observes him purchasing gold stars. Aha! Tom brilliantly exposes Marcus’ cheating and finally finishes his homework assignment. In the process, he earns three gold stars, putting him ahead of all his classmates. Tom’s clever doodles are a treasure and often visually extend the narrative, supporting young readers with additional clues about the story and characters. And for those readers who don’t know “British” check the handy (and well doodled) glossary in the back. Visit Pichon’s website for more information about the author and the series. You can also find several videos, including book trailers, “How to Draw Like Tom Gates,” and “Fun Stuff” to do. Visit The World of Tom Gates website, too. Click here for a sample chapter. New to Tom Gates? 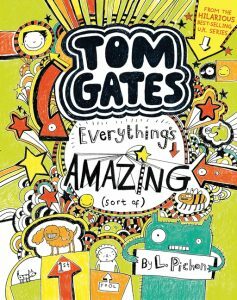 Read my previous review of The Brilliant World of Tom Gates on the Good Reads With Ronna blog to get acquainted with this terrific series. 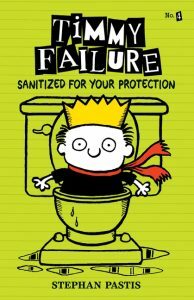 Highly recommended for tweens, ages 8-12, who enjoy the humorous, diary-style series.